. Published on Friday, October 27, 2017 . If you aren’t already in the Halloween spirit, catch up and watch some of our favorite Halloween episodes of all time. It is Halloween in Scranton and the gang at Dunder Mifflin gather to compete in their annual costume contest. This year, the prize is a Scranton coupon book. Rewatch this hilarious episode and mentally prepare for all the costume contests you’ll partake in this season. This spooky episode from the Emmy-winning series will be sure to make you laugh and get in the Halloween spirit! The Dunphy’s annual haunted house is not going as planned, Mitch (Jesse Tyler Ferguson) is stuck in a Spider-Man costume at work and Gloria (Sofia Vergara) feels teased about her accent and tries to speak without it. Fans of “The Simpsons” can agree that the annual Halloween episodes for the show are a must-watch. 2017 marks the 28th Treehouse of Horror special, and we couldn’t choose just one to highlight. This year, Treehouse of Horror XXVII, which spoofed “The Exorcist,” received excellent reviews. The exaggerated and hilarious personalities of Pawnee’s parks and rec team don’t disappoint in this Halloween-themed episode. Leslie Knope (Amy Poehler) sets a stakeout to try and catch the pesky Greg Pikitis, a high school hooligan who defaces the park each Halloween, causing confrontation between the “arch-nemeses”. Ah, how could we not include a classic “Friends” episode in this list? 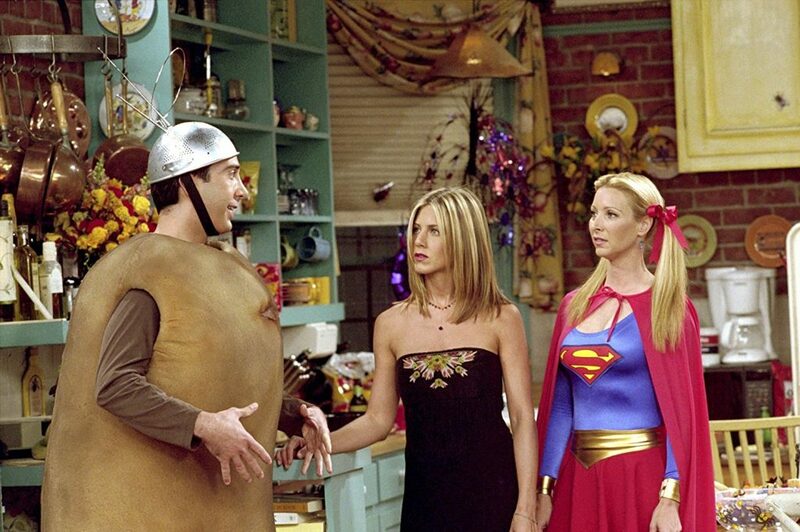 We couldn’t let Chandler’s (Matthew Perry) pink bunny costume or Ross’ (David Schwimmer) infamous “Spud-nik” costume go unrecognized. We just wish we went trick-or-treating and got checks instead of candy! Thinking back to classic Halloween episodes from our childhood, how could we forget the episode that shook us to our very core? When one of the suites at the Tipton Hotel is rumored to be haunted, the twins and the gang go check it out. We can’t help but remember how terrifying possessed Esteban was; it still gives us chills! We can’t help but gawk at the incredibly well-dressed cast in every episode of “Gossip Girl,” which makes this Halloween-themed episode a stylish dream. Lily (Kelly Rutherford) is roped into Rufus’ (Matthew Settle) Halloween costume party tradition and the usual impossible drama of a “Gossip Girl” episode ensues, including a club opening, extravagant costumes and juicy subplots. Get your popcorn ready for Halloween, upper-east side style! Which Halloween episodes will you be watching this Halloween season? Share with us by using the hashtag #CampusCropChat on Facebook, Instagram and Twitter. Don’t forget to follow us on Snapchat @ASICPP!